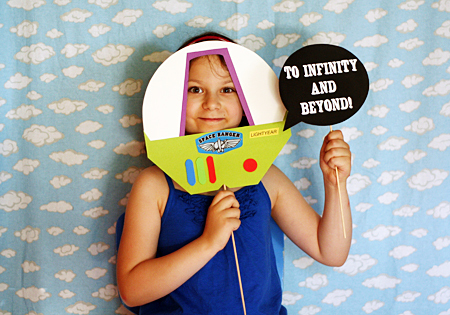 Delaney and her friends had a super-fun time at her Toy Story party. I finally had some time to sort through all the photos I took so I can share some of our party fun with you. Enjoy! 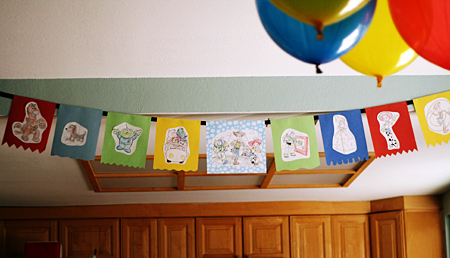 We kept the decorations pretty simple. Delaney made a banner with construction paper and Toy Story coloring pages. 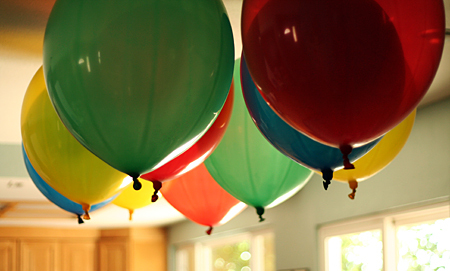 We hung giant punch balloons over the dining room table, which looked amazing! And, of course, Delaney’s various Toy Story toys were scattered around the house. I showed Delaney the make-your-own Mr. 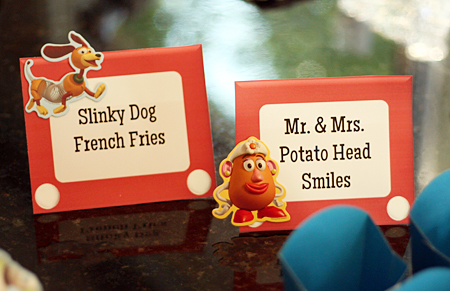 Potato Head cupcakes idea from How Does She… and she was sold on having those for dessert. 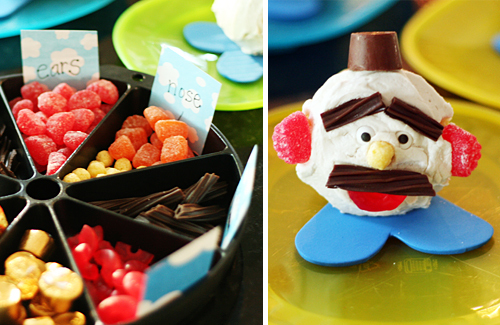 The kids had a blast making their faces and it was a super-simple dessert for me to prepare. We did vanilla/vanilla cupcakes and laid them on their sides with blue foam “shoes”. 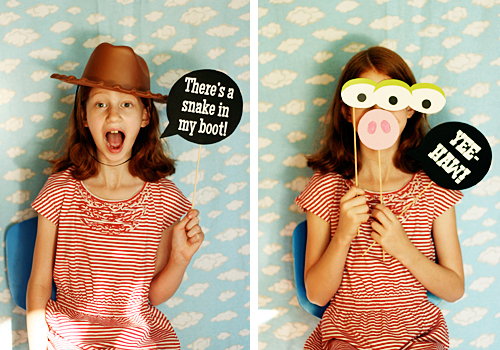 The kids absolutely loved the Toy Story photo booth! Thanks to the party photos at Catch My Party and three pugs & a baby for inspiration. 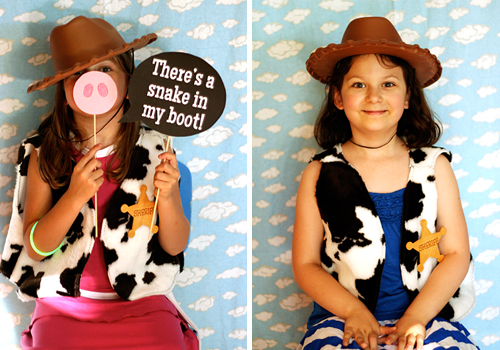 Speech bubbles: To infinity and beyond!, There’s a snake in my boot!, and Yee-Haw! I kept the photo booth “closed” for part of the party, otherwise I would have been taking the kids’ photos the entire time. So much fun! We’re planning to print the best photos to include in the thank-you notes. I’ll share the rest of our Toy Story activities and games in a separate post soon! WOW! I totally fell in love with this party. LOVE Mr. Potato Head cupcakes so cute!!! What a great idea for a party!! This looks like tons of fun! LOVE the photobooth!!!! too cute! Oh my goodness, I want to come to your girls’ birthday parties! :) I’m expecting my first child in May, and I’m already getting excited for birthday parties down the road. 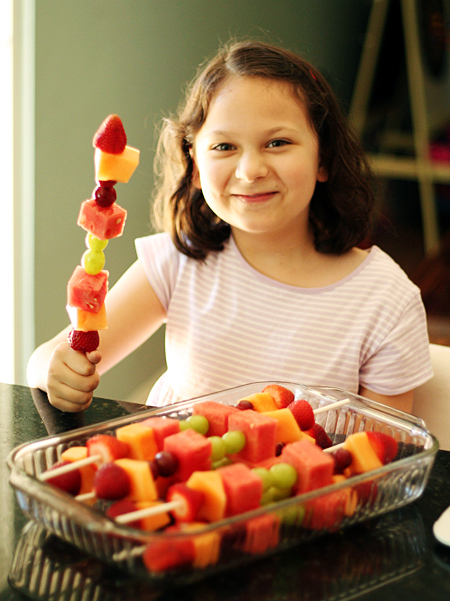 You are so ridiculously creative…thanks for all of the wonderful ideas on this website! This is such a cute party theme! One of the best I’ve ever seen (little biased, considering that’s one of my childhood favorite movies). Love it! How cute! We are doing a toy story party for my son next week. We are doing the photos. How did you get all the props? Is there a website I can print them? We have the hat and vest. I made the props with colored card stock. They were all pretty simple to make – Buzz’s helmet was the trickiest. I made the speech bubbles on my computer and just printed and cut out. The Etch-a-Sketch is a photo mat painted red, with white lids glued on for the handles. Hope that helps – have a wonderful party! Thank you. You are so much more creative than I am. I got the stuff to make the etch-a-sketch. I am working on the speech bubbles tonight. I saw Buzz and alien on another website and you could buy them and print them, but yours are way cuter! I will attempt to make them :) Thanks for the idea. I LOVE your blog. Hi….what were the dimensions of the etch a sketch? I love it! I think I used a 16″x20″ photo mat for the Etch a Sketch prop – hope that helps! Brilliant!!! 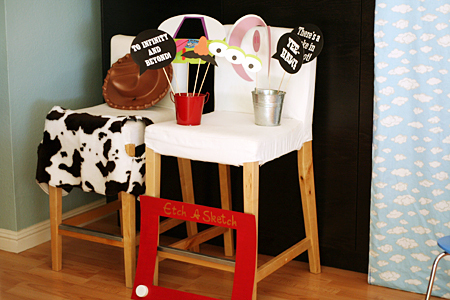 I am not very good at crafts but with some help I will try to pull off the photo booth idea!!! Thank you!!!! oh my god! everything here is perfect! Thanks to you.. I guess I copy all the stuffs here for my son’s 3rd birthday party next month and Im so excited. thank u again..
Hi, love this party!! I am using many if your ideas for my sons party. Where did you find the cloud fabric for the backdrop? I have had a hard time finding anything like it?? Thanks! Hi Laura – I found the cloud fabric at Joann’s. It’s flannel, and it may have been with the baby fabrics. You could try searching on Etsy or eBay, too. Hope you find something! How do i make the food labels? Hi, great party!! What font did you use for the “etch a sketch” frame. That is just too cute. 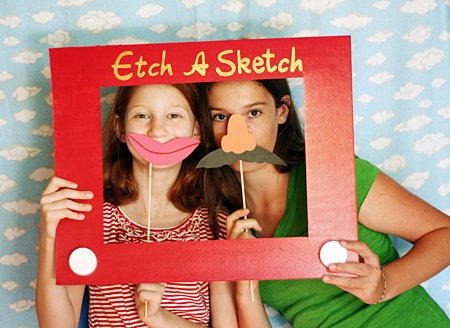 Are you talking about the Etch a Sketch prop for the photo booth? I just looked at a real Etch a Sketch and did my best to copy the logo with gold paint. On the Etch a Sketch food labels, the font is Maiden Orange. 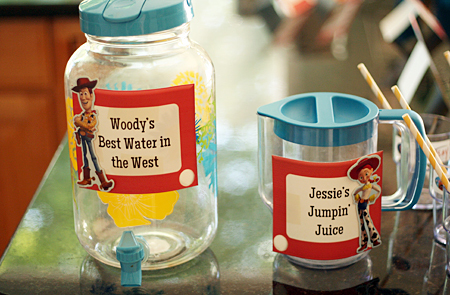 Hi I was wondering where I could find the etch a sketch labels any help would be greatly appreciated we are throwing our youngest a toy story bday party and those are very cute! 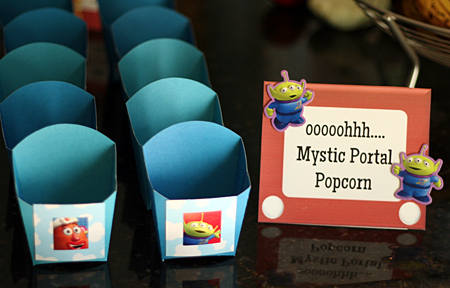 I’m planning a 4 year old birthday party and I love your etch- a- sketch food labels. I’m not at all creative and cannot figure out how you made them. Any help would be great. Thanks. Hello! where did you get the cloud background? Hi Josie – The cloud background is flannel fabric from Joann’s. Hope that helps! How did you make the food labels? wow…. so much creative :) u rock !!! where did you get the material for the etch a sketch? Hi Marina – The etch-a-sketch was made from a photo mat, painted with glossy red, and two white lids from sprinkle containers. I just hot-glued them on. Hope that helps! Hi Carmen – Yes, I just free handed the Etch-a-Sketch logo with pencil, then painted over it with gold paint. The cloud fabric is a flannel that I found at Joann’s – of course it’s been a few years ago now! Try looking in the baby fabric section maybe?